iOS 7 features a completely new look that is a lot different from how the mobile OS used to look before. The new interface was a big news not only because it changed the way iOS looks and feels but also because all apps that are already available or will be released in the future will also add a similar design. iOS 7 has not been released yet but that has not stopped third party developers to design their apps following the principles and features of iOS 7’s design. One of the apps that has been released in the App Store featuring iOS 7 inspired UI is Aero weather app for iPhone. 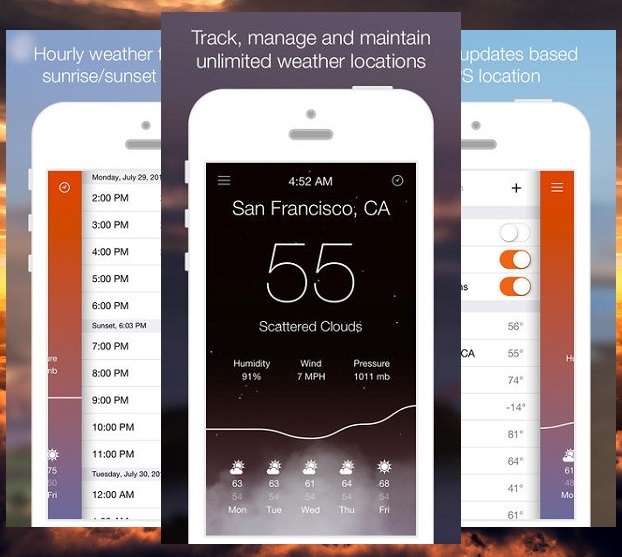 Aero weather app for iPhone features a visual interface that is heavily based on iOS 7. Altough the app provides features that are similar to the ones found in other weather apps and brings nothing new when it comes to features the look is something that will make you download it on your iPhone or iPod touch. Aero weather app for iPhone allows users to add multiple cities at one time and get up to date weather forecast for them at all times. A really nice feature of the app is that it shows the weather of your current location on the notification app so you can check it without even launching it. This is a feature we all have been wanting in iOS by default but Apple has failed us yet again by not giving us ‘live icons’. Aero weather app for iPhone has deep support for gestures and allows users perform different tasks by swiping, pulling, long pressing and tilting their device. Aero weather app for iPhone and iPod touch is available in the App Store for $0.99 here. The app does not natively supports iPad yet.